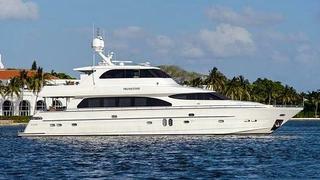 Jamie Wallace at HMY Yachts is offering a 25% discount for charters booked on the 25m motor yacht Primetime in December. Accommodating six guests in three staterooms plus a crew of three led by Captain Mitch Armstrong, Primetime comes complete with a 31' Jupiter tender. Other water toys include snorkelling gear, fishing tackle and a range of inflatables. Primetime is available in Florida and the Bahamas at weekly rates of $20,000 from December 1st to January 1st.